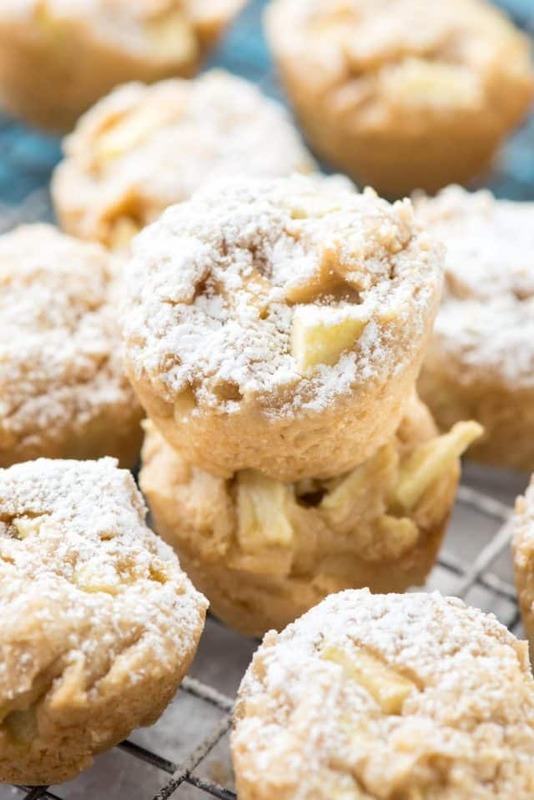 Apple Cheesecake Cookie Cups are a cream cheese infused sugar cookie full of cinnamon and apples. This is the perfect easy cookie recipe for fall and apple season! It’s apple season! Apple Hill outside Sacramento is now open for business although I won’t be going until it cools down quite a bit. There’s nothing like going apple picking, cider drinking, and pie eating when it’s 90°F. What I love most about apple season is that apple prices drop and there are a ton more options at the store. In California we can get good apples all year long, of course, but in the fall they taste so much better. Apple season is the perfect time to make all the apple types of desserts, like dump cake or pie or pie bars or cookies. It’s also the time I buy gallons of cider to make quick bread loaves and cakes (and, yes, even pie!) As you can see, I’m in love with all things apple. And now I’m in love with Apple Cheesecake Cookie Cups! These little bites of heaven are a brown sugar cookie that’s tender and soft and full of diced apples and cinnamon. Dusted with some powdered sugar they’re the perfect cookie for fall, especially if you’ve gone apple picking. These are called cheesecake cookies because I made them with a combination of butter and cream cheese. I’ve only ever made cream cheese cookies once before and it was so long ago all I remembered was that they were good. You guys, they’re better than good. The cream cheese makes them softer and fluffier and adds that telltale tang to the cookie flavor. With the apples and brown sugar, these taste like a nice bite of apple cheesecake! If you’ve never tried substituting some of the butter in a cookie recipe with cream cheese, you must try it. When you’re choosing ingredients for this recipe, be sure to use the ones you love. I used Granny Smith apples because they’re my favorite for baking. 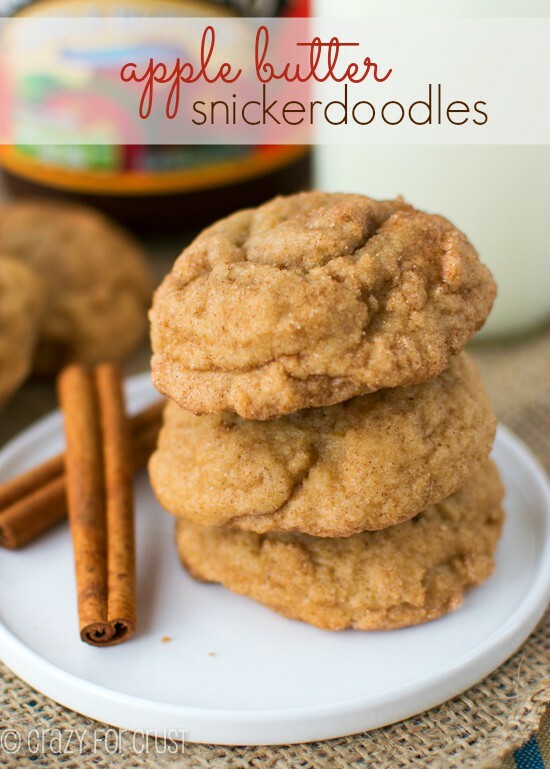 They hold up and add a bit of tart with the sweet cookie flavor. Of course, a cheesecake cookie has to have cream cheese, so I used my favorite, Challenge Cream Cheese as well as Challenge Unsalted Butter. I’ve been using their butter since I was a kid and it’s my family’s favorite. The cream cheese is my favorite too – it’s so soft and creamy. If you thought you couldn’t buy challenge in your area, good news! Challenge is now available nationwide. Click here to find it near you. 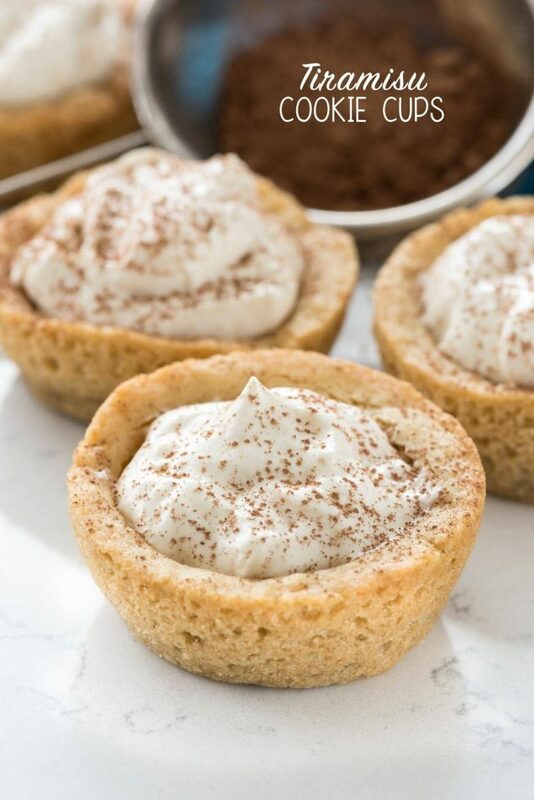 You could definitely make these as a regular cookie, but I love making cookie cups or bites because then I don’t have to worry about them spreading. I don’t have to chill the dough and they pop easily out of the muffin pan. Bite sized cookies like this go perfectly on a cookie tray, so be sure to save this recipe for holiday baking! 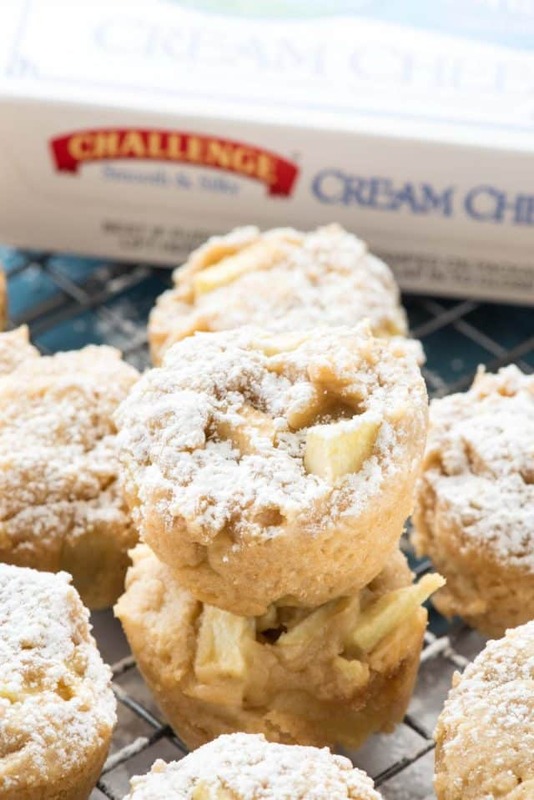 Apple Cheesecake Cookie Cups are EASY to make and perfect for freezing so you’ll have them all season long. Make sure to use nonstick cooking spray or grease your pans well for easy release. Let them cool a bit before taking them out of the pan too, and a butter knife can help release them easier. 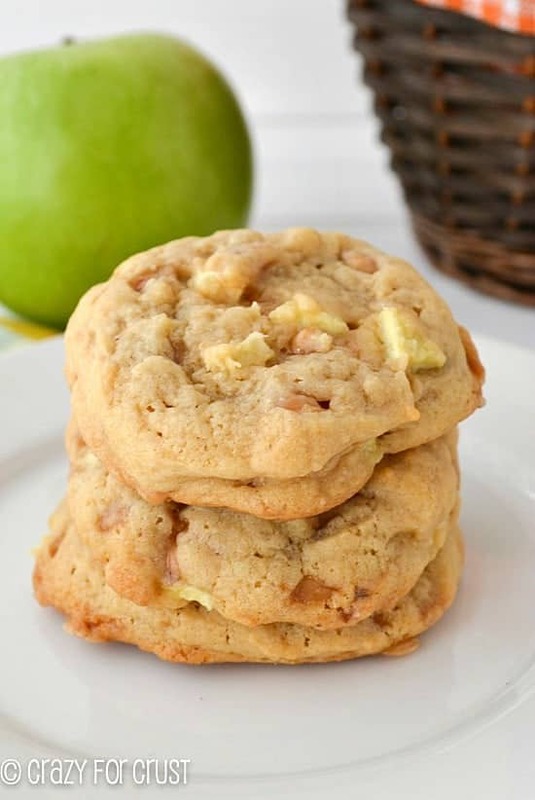 If you don’t love the apples in these cookies, add whatever you like! I can’t wait to try chocolate chips. Try to dice the apples as small as you can, it makes for easier eating. These cookies freeze well and can be made up to a month ahead of time. Beat butter and cream cheese until smooth. Mix in brown sugar until mixture is creamy, then mix in egg and vanilla. Add baking powder, baking soda, cinnamon, and salt and mix until combined then slowly mix in flour until cookie dough forms. Stir in diced apples. Scoop 2 tablespoon balls of dough into each muffin cavity. Press lightly to compact. Bake for 10-20 minutes or until golden brown around the edges. Cool at least 10 minutes before removing from pan. Serving suggestion: dust with powdered sugar before serving. Hi Dorothy Kern…! your dish is amazing and looks so yummy. this is one of the most delicious dish and i will make it in upcoming weekend. thanks for the sharing your recipe. I love adding cream cheese to dough and I’m sure it made these so good! I love everything about these Dorothy! So creative! Yay for apple season! These sound so divine. I can’t wait to try them, perfect fall dessert! How would you adapt to make as a bar cookie? Oh, my – there you go again , creating something I didn’t know I needed til I saw it on your blog. Yummmmm! These look delectable? Oh, you didn’t. I mean, just look at all of the deliciousness in the title alone. These look SO perfect! Any advice on how to adapt these for a regular sized muffin tin or a cookie sheet? hello Dorothy….! this is one of my favorite dish till now. your dish looks so delicious and yummy i will make it in few upcoming days…Thanks for the sharing and keep shared your amazing ideas and recipes….! Wow, this is a great recipe. I just made it. I am following you and other cooking websites for making recipes but your way of cooking is amazing.Last night i made Chicken Keema Paratha Recipe .It’s taste so delicious.